I have heard along the grapevine that at some point, Dragonborn can get wings and/or a tail. But I haven't been able to find anything on it. I have looked through the Player's Handbook, and I couldn't find anything in there about it. So do Dragonborn get tails or wings at any point? I know they don't start with any, but as I said previously, I heard they could. Does it depend on the ancestry as well? (I.e. Blue Dragonborn only get tails, Black only get wings etc). This is the inspiration for this question. I'm unsure of where it came from, it may just be fan art, but I have seen similar images (perhaps by the same artist) that led me to believe that this may be canon. No. You're probably thinking of the Dragon Wings feature from the Sorcerer's Draconic Bloodline archetype. 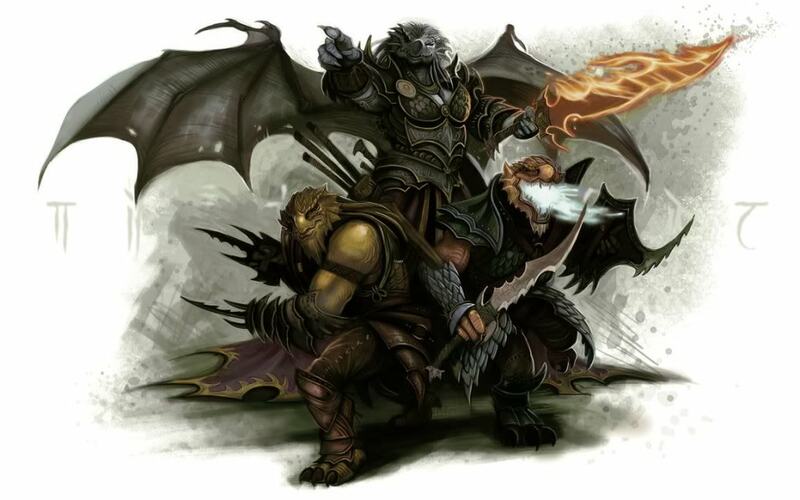 Justin's answer is correct by the core rules, however, the Feats for Races Unearthed Arcana, released 2017-04-24, has the Dragon Wings Feat (pg2), which is Dragonborn-only and gives the character wings. Mechanically, this grants a 20' fly speed while not in heavy armour. Note that Unearthed Arcana additions are playtest material and thus not guarunteed to be balanced. As always, ask your DM first and be prepared for a 'no'. What's the physical appearance of Dragonborns?